Ken Ham, founder of Answers in Genesis has a popular phrase he uses when describing geologic evidence for the Flood to lay people. He says we should see billions of dead things buried in rock layers laid down by water all over the world, and then states that that's exactly what we find. Well...yes and no. 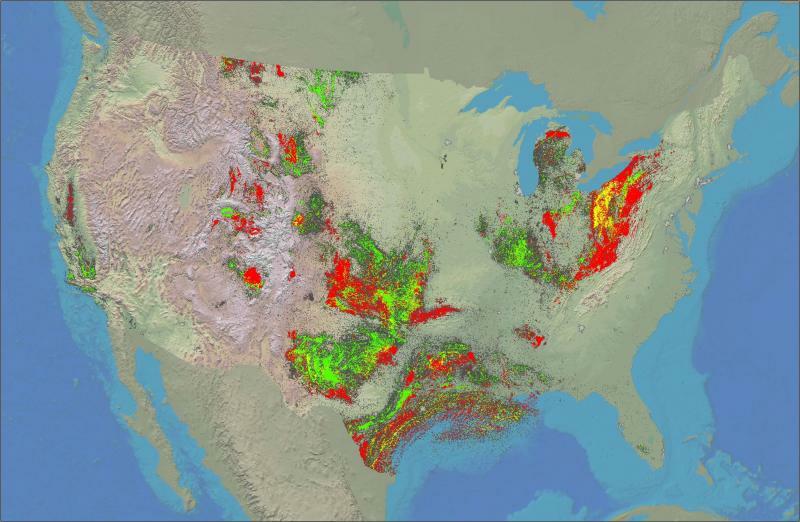 Look at the image below from the USGS of historical oil and gas production in the U.S. Since oil and gas are called fossil fuels, it stands to reason that it is where it is because that's where dead organisms were buried, primarily in sedimentary basins. Hopefully the first thing you will notice in the image above is that the distribution of oil & gas wells is not random. This is because the distribution of sedimentary basins is not random. So, Ken Ham’s statement that fossils are found all over the world, is misleading. If a global Flood was responsible for depositing all of the fossil-bearing strata, then yes, we would expect to find them randomly distributed all over the world. But this is NOT what we find. We find order and reasons for why things are where they are. Some important questions to ask are, why are there just 2 wells drilled in all of New England and over 1 million in Texas? Its not because of size or politics. Why are there so few wells in the north central U.S.? Why not along the Atlantic coast? Why not in the northwest? Why is there an abrupt northeast-southwest line of no production in Texas? Why are the colors (oil vs. gas) clustered together, sometimes in bands? These questions are easily answered when it’s understood that geologic processes were at work over a long period of time. I would argue it is impossible to get the order and distribution that you see on this map if random processes were at work in a global Flood. The barren strip bisecting Texas is the old Ouachita orogenic front. Towards the end of the Paleozoic Era, Gondwanaland (Africa) collided with Laurentia (North America) forming a chain of mountains seen from the Appalachians in the northeast through the Ozarks and down through the Ouachitas in Texas. Along this chain, mostly Pre-Cambrian and lowermost Paleozoic rocks are exposed. Younger fossil and petroleum-bearing rocks were uplifted and eroded away leaving the basement root at or near the surface. There are several prolific basins on the northern side of this orogenic front all along its trend. On the south side, in Texas, the Gulf of Mexico began rifting apart in the Triassic. This is why you find Paleozoic rocks on the north side and Mesozoic and younger rocks on the south side. Since dinosaurs lived in the Mesozoic, you will not find their fossil remains in, say, the Appalachian or Ft. Worth Basins, but you will find dinosaur footprints in the East Texas Basin south of the Ouachita front (see picture below). You would not see this pattern formed from a random worldwide Flood that catastrophically deposited sediment across the globe. Footprint of the therapod dinosaur Acrocanthosaurus in the Cretaceous Glen Rose Formation near Fort Worth, Texas. Since numerous fossils are found in these and other Cretaceous sedimentary rocks, they are often attributed to the Flood by Young-Earth Creationists. One would wonder, however, how these dinosaurs had a chance for a walk on the beach in the middle of a global, tectonically catastrophic event such as the Flood. The rocks cry out against this hypothesis in a strong way (photo by author, my foot is about 3 feet above the track). Likewise, New England is the result of several continental collisions starting in the Ordovician (Taconic) through the Devonian (Acadian) and into the Pennsylvanian (Alleghenian). It is therefore composed of primarily igneous and metamorphic rocks and not conducive to oil & gas exploration. The north-central U.S. is the southernmost extent of the Canadian, or Laurentian, shield which is the root of the continent. You will find Pre-Cambrian igneous rocks at the surface there which pre-date the creation of most of the petroleum generating organisms. Again, a global Flood cannot reproduce or predict the distribution of sedimentary basins in the United States, which display order and follow suit with geologic principles as we understand them today.